See Timeline of human evolution, Timeline of natural history for earlier evolutionary history. 315,000 years ago: approximate date of appearance of Homo sapiens (Jebel Irhoud, Morocco). 120,000–75,000 years ago: Khoisanid back-migration from Southern Africa to East Africa. 100,000 years ago: Earliest structures in the world (sandstone blocks set in a semi-circle with an oval foundation) built in Egypt close to Wadi Halfa near the modern border with Sudan. 80,000–70,000 years ago: Recent African origin: separation of sub-Saharan Africans and non-Africans. 75,000 years ago: Toba Volcano supereruption that may have contributed to human populations being lowered to about 15,000 people. "Epipaleolithic" or "Mesolithic" are terms for a transitional period between the Last Glacial Maximum and the Neolithic Revolution in Old World (Eurasian) cultures. 45,000–43,000 years ago: European early modern humans. 45,000–40,000 years ago: Châtelperronian culture in France. 31,000–16,000 years ago: Last Glacial Maximum (peak at 26,500 years ago). 25,000 years ago: a hamlet consisting of huts built of rocks and of mammoth bones is founded in what is now Dolní Věstonice in Moravia in the Czech Republic. This is the oldest human permanent settlement that has yet been found by archaeologists. 20,000–10,000 years ago: Khoisanid expansion to Central Africa. 20,000–19,000 years ago: earliest pottery use, in Xianren Cave, China. 16,000–13,000 years ago: first human migration into North America. 16,000–11,000 years ago: Caucasian Hunter-Gatherer expansion to Europe. 15,000–14,700 years ago (13,000 BC to 12,700 BC): Earliest supposed date for the domestication of the pig. 14,500–11,500: Red Deer Cave people in China, possible late survival of archaic or archaic-modern hybrid humans. 14,000–12,000 years ago: Oldest evidence for prehistoric warfare (Jebel Sahaba massacre, Natufian culture). 13,000–11,000 years ago: Earliest dates suggested for the domestication of the sheep. 12,900–11,700 years ago: the Younger Dryas was a period of sudden cooling and return to glacial conditions. The terms "Neolithic" and "Bronze Age" are culture-specific and are mostly limited to cultures of the Old World. Many populations of the New World remain in the Mesolithic cultural stage until European contact in the modern period. 11,200–11,000 years ago: Meltwater pulse 1B, a sudden rise of sea level by 7.5 m within about 160 years. 10,800–9,000 years ago: Byblos appears to have been settled during the PPNB period, approximately 8800 to 7000 BC. Neolithic remains of some buildings can be observed at the site. 10,000–8,000 years ago (8000 BC to 6000 BC): The post-glacial sea level rise decelerates, slowing the submersion of landmasses that had taken place over the previous 10,000 years. 10,000–9,000 years ago (8000 BC to 7000 BC): In northern Mesopotamia, now northern Iraq, cultivation of barley and wheat begins. At first they are used for beer, gruel, and soup, eventually for bread. In early agriculture at this time, the planting stick is used, but it is replaced by a primitive plow in subsequent centuries. Around this time, a round stone tower, now preserved to about 8.5 meters high and 8.5 meters in diameter is built in Jericho. 10,000–5,000 years ago (8,000–3,000 BC) Identical ancestors point: sometime in this period lived the latest subgroup of human population consisting of those that were all common ancestors of all present day humans, the rest having no present day descendants. 9,500 years ago (7500 BC): Çatalhöyük urban settlement founded in Anatolia. Earliest supposed date for the domestication of the cat. 8,200–8,000 years ago: 8.2 kiloyear event: a sudden decrease of global temperatures, probably caused by the final collapse of the Laurentide Ice Sheet, which leads to drier conditions in East Africa and Mesopotamia. 8,200–7,600 years ago (6200–5600 BC): sudden rise in sea level (Meltwater pulse 1C) by 6.5 m in less than 140 year; this concludes the early Holocene sea level rise and sea level remains largely stable throughout the Neolithic. 8,000–5,000 years ago: (6000 BC–3000 BC) development of proto-writing in China, Southeast Europe (Vinca symbols) and West Asia (proto-literate cuneiform). 7,200–6,000 years ago: 5200–4000 BC:Għar Dalam phase on Malta. First farming settlements on the island. 6,070–6,000 years ago (4050–4000 BC): Trypillian build in Nebelivka (Ukraine) settlement which reached 15,000–18,000 inhabitants. 5,800 years ago (3800 BC): Trypillian build in Talianki (Ukraine) settlement which reached 15,600–21,000 inhabitants. 5,700 years ago (3700 BC): Trypillian build in Maidanets (Ukraine) settlement which reached 12,000–46,000 inhabitants, and built 3-storey building. 5,500 years ago: End of the African humid period possibly linked to the Piora Oscillation: a rapid and intense aridification event, which probably started the current Sahara Desert dry phase and a population increase in the Nile Valley due to migrations from nearby regions. It is also believed this event contributed to the end of the Ubaid period in Mesopotamia. 5,300 years ago: (3300 BC): Bronze Age begins in the Near East Newgrange is built in Ireland. Ness of Brodgar is built in Orkney Hakra Phase of the Indus Valley Civilisation begins in the Indian subcontinent. 5,300–5,000 years ago (3300–3000 BC): Saflieni phase in Maltese prehistory. For the early historical period, see Timeline of ancient history. For the prehistoric period in Sub-Saharan Africa and in the New World, see Sub-Saharan_Africa § Prehistory, pre-Columbian Americas, and prehistoric Australia. ^ Erin Wayman (11 January 2012). "Meet the Contenders for Earliest Modern Human". smithsonian.com. ^ "Lice DNA study shows humans first wore clothes 170,000 years ago". ScienceDaily. 7 January 2011. ^ a b Rito T, Richards MB, Fernandes V, Alshamali F, Cerny V, Pereira L, Soares P., "The first modern human dispersals across Africa", PLoS One 2013 Nov 13; 8(11):e80031. doi:10.1371/journal.pone.0080031. "By ~130 ka two distinct groups of anatomically modern humans co-existed in Africa: broadly, the ancestors of many modern-day Khoe and San populations in the south and a second central/eastern African group that includes the ancestors of most extant worldwide populations. Early modern human dispersals correlate with climate changes, particularly the tropical African “megadroughts” of MIS 5 (marine isotope stage 5, 135–75 ka) which paradoxically may have facilitated expansions in central and eastern Africa, ultimately triggering the dispersal out of Africa of people carrying haplogroup L3 – 60 ka. Two south to east migrations are discernible within haplogroup L0. One, between 120 and 75 ka, represents the first unambiguous long-range modern human dispersal detected by mtDNA and might have allowed the dispersal of several markers of modernity. A second one, within the last 20 ka signalled by L0d, may have been responsible for the spread of southern click-consonant languages to eastern Africa, contrary to the view that these eastern examples constitute relics of an ancient, much wider distribution." ^ "Ancient Egypt Online – Lower Paleolithic". Retrieved 20 January 2019. ^ "World's Oldest Manufactured Beads Are Older Than Previously Thought". Science Daily. 7 May 2009. Retrieved 22 November 2013. ^ "Mount Toba Eruption – Ancient Humans Unscathed, Study Claims". Retrieved 20 April 2008. 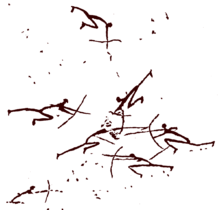 ^ "World's oldest needle found in Siberian cave that stitches together human history". Siberian Times. 23 August 2016. ^ John Noble Wilford (3 November 2011). "Fossil Teeth Put Humans in Europe Earlier Than Thought". The New York Times. p. A4. ^ a b Tom Higham; Katerina Douka; Rachel Wood; Christopher Bronk Ramsey; Fiona Brock; Laura Basell; Marta Camps; Alvaro Arrizabalaga; Javier Baena; Cecillio Barroso-Ruíz; Christopher Bergman; Coralie Boitard; Paolo Boscato; Miguel Caparrós; Nicholas J. Conard; Christelle Draily; Alain Froment; Bertila Galván; Paolo Gambassini; Alejandro Garcia-Moreno; Stefano Grimaldi; Paul Haesaerts; Brigitte Holt; Maria-Jose Iriarte-Chiapusso; Arthur Jelinek; et al. (21 August 2014). "The timing and spatiotemporal patterning of Neanderthal disappearance". Nature. 512 (7514): 306–09. Bibcode:2014Natur.512..306H. doi:10.1038/nature13621. PMID 25143113. ^ Corbyn, Zoë (24 November 2011). "Archaeologists land world's oldest fish hook". Nature. doi:10.1038/nature.2011.9461. Retrieved 22 October 2014. ^ O'Connor, Sue; Ono, Rintaro (25 November 2011). "Pelagic Fishing at 42,000 Years Before the Present and the Maritime Skills of Modern Humans". Science. 334 (6059): 1117–21. Bibcode:2011Sci...334.1117O. doi:10.1126/science.1207703. PMID 22116883. ^ William E. Banks; Francesco d'Errico; João Zilhão (2013). "Revisiting the chronology of the Proto-Aurignacian and the Early Aurignacian in Europe: A reply to Higham et al. 's comments on Banks et al". Journal of Human Evolution. 65 (6): 810–17. doi:10.1016/j.jhevol.2013.08.004. PMID 24095637. ^ Macey, Richard (15 September 2007). "Settlers' history rewritten: go back 30,000 years". The Sydney Morning Herald. Retrieved 5 July 2014. ^ Sandra Bowdler. "Human settlement". In D. Denoon (ed.). The Pleistocene Pacific. The Cambridge History of the Pacific Islanders. Cambridge: Cambridge University Press. pp. 41–50. Archived from the original on 16 February 2008. Retrieved 26 February 2008 – via University of Western Australia. ^ Elizabeth Landau (14 November 2013). "Dogs first domesticated in Europe, study says". CNN. ^ "Ancient domesticated dog skull found in Siberian cave: 33,000 years old". ScienceDaily. 24 January 2012. 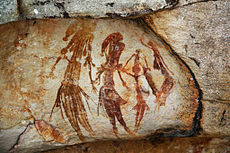 ^ "Rock Shelters of Bhimbetka". World Heritage Site. Archived from the original on 8 March 2007. Retrieved 15 February 2007. ^ a b Adam Benton (5 July 2012). "The oldest pottery discovered". EvoAnth. ^ Flood, J. M.; David, B.; Magee, J.; English, B. (1987). "Birrigai: a Pleistocene site in the south eastern highlands". Archaeology in Oceania. 22: 9–22. doi:10.1002/j.1834-4453.1987.tb00159.x. ^ "Shift from Savannah to Sahara was Gradual", by Kenneth Chang, The New York Times, 9 May 2008. ^ Mithen, Steven (2006). After the ice: a global human history, 20,000–5000 BC (1st Harvard University Press pbk. ed.). Cambridge, Massachusetts: Harvard University Press. p. 57. ISBN 978-0-674-01999-7. ^ Curry, Andrew (November 2008). "Gobekli Tepe: The World's First Temple?". Smithsonian.com. Retrieved 2 August 2013. ^ E.J. Peltenburg; Alexander Wasse; Council for British Research in the Levant (2004). Garfinkel, Yosef., "Néolithique" and "Énéolithique" Byblos in Southern Levantine Context* in Neolithic revolution: new perspectives on southwest Asia in light of recent discoveries on Cyprus. Oxbow Books. ISBN 978-1-84217-132-5. Retrieved 18 January 2012. ^ Vogel, J.C. and Waterbolk, H.T., "Groningen Radiocarbon Dates X", Radiocarbon, 14, 6–110 / 105, 1972. 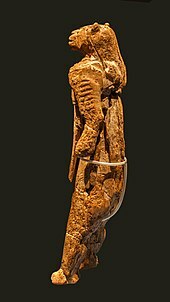 ^ "Signs of early settlement in the Nordic region date back to the cradle of civilisation". 8 February 2016. ^ Blanchon, P. (2011b) Backstepping. In: Hopley, D. (Ed), Encyclopedia of Modern Coral Reefs: Structure, form and process. Springer-Verlag Earth Science Series, pp. 77–84. ISBN 978-90-481-2638-5. Blanchon, P., and Shaw, J. (1995) Reef drowning during the last deglaciation: evidence for catastrophic sea-level rise and icesheet collapse. Geology, 23:4–8. ^ Moore, A.M.T. The Neolithic of the Levant. Oxford: Oxford University, 1978. 192–98. ^ "The prehistoric archaeology of the temples of Malta". Bradshaw Foundation. ^ Thomas K. Harper. "The effect of climatic variability on population dynamics of the Cucuteni-Tripolye cultural complex and the rise of the Western Tripolye giant-settlements" (PDF). Chronikajournal.com. Retrieved 14 November 2016. ^ Müller, Johannes; Rassmann, Knut; Videiko, Mykhailo (22 January 2016). Trypillia Mega-Sites and European Prehistory: 4100–3400 BCE. p. 347. ISBN 978-1317247913. Retrieved 14 November 2016. ^ Müller, Johannes; Rassmann, Knut; Videiko, Mykhailo (22 January 2016). Trypillia Mega-Sites and European Prehistory: 4100–3400 BCE. Routledge. ISBN 978-1317247913. Retrieved 13 November 2016 – via Google Books. ^ Müller, Johannes. "High precision Tripolye settlement plans, demographic estimations and settlement organization". Academia.edu. Retrieved 13 November 2016. ^ "ДОСЛІДИ З ТРИПІЛЬСЬКОГО ДОМОБУДІВНИЦТВА" (PDF). Inst-ukr.lviv.ua. Retrieved 14 November 2016. ^ Towers, Roy; Card, Nick; Edmonds, Mark (2015). The Ness of Brodgar. Kirkwall, UK: Archaeology Institute, University of the Higlands and Islands. ISBN 978-0-9932757-0-8. ^ Childe, V. Gordon; Clarke, D. V. (1983). Skara Brae. Edinburgh: Her Majesty's Stationery Office. ISBN 0-11-491755-8. Kristian Kristiansen; Thomas B. Larsson (2005). The Rise of Bronze Age Society: Travels, Transmissions and Transformations. Cambridge University Press. ISBN 978-0521843638. Ross Burns (2005). Damascus : A History. Routledge. ISBN 978-1134488506.